My journey with Grandma has come to an end……On July 12th around 7:30 in the evening, Grandma took her final breath here in this world. I’m not sad for her…..but I am sad for me. This last two years my life has revolved around her….visiting her on a daily basis…feeding her lunch or supper (depending on the day)…spending Friday and Saturday evenings with her….going to church with her at the nursing home on Sunday mornings and then feeding her lunch….decorating her room for holidays and new seasons…..taking her to activities…..watching her sleep…..seeing her sparkly blue eyes light up when I would walk into the room…..laughing as Grandma would crack me up with some random remark…..holding her hands….rubbing her feet….putting lotion on her…..giving her manicures…..bringing her treats…….praying with her….. Sooooooo many memories and I’m grateful for each one. I’m so glad I made the decision two years ago to move from Michigan to Knoxville, TN. I was the assistant to our wellness director at the YMCA in Muskegon, Michigan, and was going to be hired as the director in the next few months….I took a leave of absence for one month and while I was checking things out in Knoxville, I interviewed with a Y and was given the chance to teach Zumba once a week. That was enough to know that I was supposed to move….my career as a director was put on hold and I quit working 40+ hours per week and started over with just one class per week. Scary? Yes! But knew that everything would work out and that Grandma was my mission and my purpose in life at the time. For two precious years I was able to be with her on a daily basis…I find it interesting that she was my caregiver the first two years of my life (my Mom worked full time when I was born so Grandma was my babysitter) and I was her caregiver the last two years of her life. And, I wasn’t ready for her to leave just yet….thought I had more time….I spent time with her on Wednesday, July 4th and then I left on Thursday for a few days…went to Delaware to celebrate a wedding. I got back to the nursing home on Tuesday, July 10th and walked in Grandma’s room to see her on oxygen and not looking well. I just thought her O2 levels were low and the oxygen would make her all better. I spent time with her and then had classes to teach. Wednesday morning, the nursing home called to let us know that Grandma was not doing well and probably would not be with us longer than a few days. I finished teaching my morning classes and hurriedly showered to get there. I walked in and knew that she would not rally back for us this time….I called my Mom and told her she needed to get on a plane or get in the car and start driving. Grandma was not left alone until 6 p.m. on Thursday…..people came to hug on her and love on her. I stayed by her side until 6:00 Thursday morning….had precious alone time with her and sang her favorite songs and then reminded her of all the things we did together – assured her that she was the best grandmother and that she had done a great job. She would hear my voice and focus in on me for a moment – or if I got up and did something, she would become alert again before fading out. I gave her many kisses and just loved, loved, loved on her. My boyfriend, Jeff, arrived around 1 in the morning and stayed with me until my parents arrived at 5 a.m. Mom stayed with her while we all left to get a little sleep. We all came back and spent most of Thursday with her – I decided to go ahead and teach one class – my parents and uncle went to get a bite to eat….and while we were all gone, Grandma took her final breath. I really believe she wanted to protect us from seeing her leave us. Grandma was 85 and would have turned 86 on the 25th of this month. She lived a full life and made many memories with all of us. She showered us with love – prayed for us – bragged on us – gave of her time, energy, and money – she never missed a birthday or special occasion – she was a classy lady who dressed like a queen. She loved wearing White Diamonds and her clothes still smell like it. She carried beautiful embroidered handkerchiefs and loved her angel brooches. Her life was celebrated and remembered by the many people who came to the visitation and funeral. She was surrounded by pink, her favorite color. The flowers that arrived were simply breathtaking and would have made her so happy. One thing she would have been upset with is her thumbnail was snagged and not filed….she would not have liked that!!! 🙂 Her nails were always manicured. I didn’t wear black….i wore ivory and rose because that is what Grandma would have wanted. And my sister and I sang at her service…something else Grandma would have wanted. Now we begin the process of continuing life without her being in our daily lives and routines – that is a little unsettling because there will be no more Grandma’s house to go to….and as we all know, there’s no one like Grandma 🙂 My daily routine will seem empty and void for a while….my family has been here so it’s not settled in, yet…and I know I have more tears to cry. However, the last two years of my life have been filled with so much love and joy and all the moments are priceless. I’m honored that I was able to have that time with her. Life is short and we never know when we will have to say goodbye to a loved one….that’s why it’s important to focus on what matters and what will last. 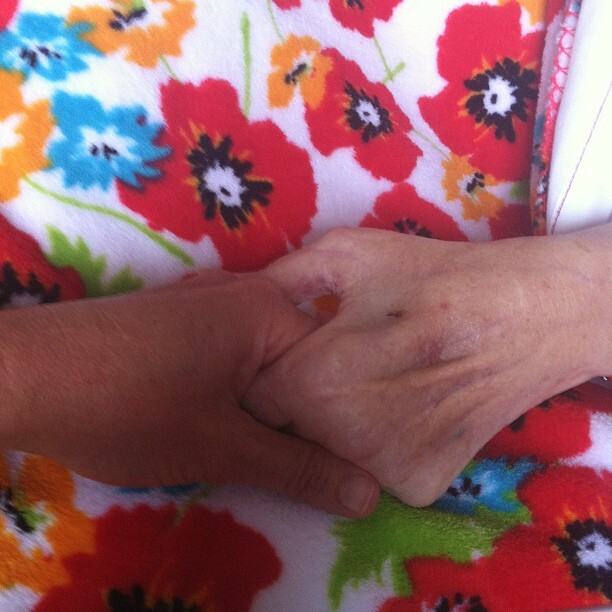 Goodbye, my sweet grandmother…..until we meet in Heaven…..
← Let’s make a memory…. nicely written. memories are everything. without we are just a vessel.